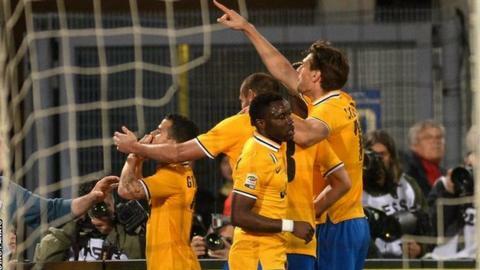 Juventus took another step towards the Italian league title with a comfortable win at Udinese. Sebastian Giovinco scored a superb early opener, turning smartly on the edge of the area before curling home. Fernando Llorente stabbed home the second in a crowded penalty area to ease the visitors into a lead that was never seriously threatened. Chasing a hat-trick of Serie A titles, Juventus are eight points clear of Roma, with only five games remaining. Giovinco was selected in place of the rested Carlos Tevez and came close to netting a second when he fired against a post midway through the second half. Juventus eased off after that, although Udinese barely created a chance of note until Luis Muriel's injury-time shot beat Gianluigi Buffon but bounced back off the post. The result means Juventus will render their top-of-the-table clash with Roma on 9 May meaningless if they win their next three matches. Match ends, Udinese 0, Juventus 2. Second Half ends, Udinese 0, Juventus 2. Martín Cáceres (Juventus) wins a free kick in the defensive half. Foul by Luis Muriel (Udinese). Allan (Udinese) wins a free kick on the right wing. Offside, Udinese. Bruno Fernandes tries a through ball, but Roberto Pereyra is caught offside. Attempt blocked. Bruno Fernandes (Udinese) right footed shot from the centre of the box is blocked. Luis Muriel (Udinese) hits the right post with a left footed shot from the left side of the box. Assisted by Nico López with a through ball. Attempt missed. Danilo (Udinese) right footed shot from the centre of the box is high and wide to the left. Assisted by Nico López following a corner. Attempt blocked. Bruno Fernandes (Udinese) left footed shot from the centre of the box is blocked. Assisted by Gabriel Silva. Corner, Udinese. Conceded by Mauricio Isla. Attempt missed. Bruno Fernandes (Udinese) right footed shot from outside the box is too high. Assisted by Luis Muriel following a corner. Attempt saved. Maurizio Domizzi (Udinese) left footed shot from a difficult angle on the left is saved in the bottom left corner. Maurizio Domizzi (Udinese) wins a free kick in the attacking half. Substitution, Juventus. Pablo Daniel Osvaldo replaces Fernando Llorente. Substitution, Juventus. Mirko Vucinic replaces Sebastian Giovinco because of an injury. Delay in match Sebastian Giovinco (Juventus) because of an injury. Angelo Ogbonna (Juventus) wins a free kick in the defensive half. Foul by Nico López (Udinese). Substitution, Udinese. Nico López replaces Antonio Di Natale. Substitution, Juventus. Mauricio Isla replaces Stephan Lichtsteiner. Stephan Lichtsteiner (Juventus) is shown the yellow card. Foul by Sebastian Giovinco (Juventus). Bruno Fernandes (Udinese) wins a free kick in the defensive half. Offside, Juventus. Paul Pogba tries a through ball, but Fernando Llorente is caught offside. Substitution, Udinese. Luis Muriel replaces Hassan Yebda. Sebastian Giovinco (Juventus) hits the right post with a right footed shot from the left side of the box. Assisted by Giorgio Chiellini. Attempt blocked. Fernando Llorente (Juventus) right footed shot from the left side of the box is blocked. Assisted by Claudio Marchisio. Attempt missed. Fernando Llorente (Juventus) header from very close range misses to the left. Assisted by Sebastian Giovinco with a cross. Hassan Yebda (Udinese) wins a free kick in the defensive half. Corner, Juventus. Conceded by Maurizio Domizzi.